Taiwanese-American violist CHE-YEN CHEN is a founding member of the Formosa Quartet and a First Prize winner of the 2006 London International String Quartet Competition. He was awarded First Prize at the 2003 Primrose International Viola Competition and has been described by San Diego Union Tribune as an artist whose "most impressive aspect of his playing was his ability to find not just the subtle emotion, but the humanity hidden in the music." Having served as principal violist of the San Diego Symphony and the Mainly Mozart Festival Orchestra, he has appeared as guest principal with numerous major orchestras in North America. A former member of Lincoln Center Chamber Music Society Two and participant at the Marlboro Music Festival, he is also a member of Camera Lucida and The Myriad Trio, and has been featured frequently at festivals such as the Seattle Chamber Music Society, Chamber Music International, and La Jolla Summerfest. He serves on the faculty of the UCLA Herb Alpert School of Music and the USC Thornton School of Music. Winners of the First Prize and the Amadeus Prize at the London International String Quartet Competition in 2006, the FORMOSA QUARTET is “one of the very best quartets of their generation” (David Soyer, cellist of the Guarneri Quartet). Its debut recording on the EMI label was hailed as “spellbinding” (Strad Magazine) and “remarkably fine” (Gramophone), and the quartet has given critically acclaimed performances at the Ravinia Festival, the Caramoor Festival, the Library of Congress, the Da Camera Society of Los Angeles, the Chicago Cultural Center, the Walter Reade Theater at Lincoln Center, Rice University, San Francisco State University, and Wigmore Hall in London. Formed in 2002 when the four founding members came together for a concert tour of Taiwan, the Formosa Quartet is deeply committed to championing Taiwanese music and promoting the arts in the land of its heritage. Pianist JULIANA HAN is an active collaborator, chamber musician, and soloist, lauded not only for her thoughtful and inspired performances but also for her musical lectures, which have introduced classical works to diverse audiences. She has performed in New York's major venues, including Carnegie Hall, Alice Tully Hall, and Merkin Hall, as well as in other notable venues across North America and Asia. Her festival appearances include the Music Academy of the West, Norfolk Chamber Music Festival, and Kneisel Hall Chamber Music Festival. Previously Adjunct Faculty at the Juilliard School, Dr. Han joins the faculty of Augustana College this fall as Assistant Professor of Piano. She also holds degrees in biochemistry and law, both from Harvard University, and has worked as a biotech specialist at L.E.K. Consulting and as a corporate attorney at Cravath, Swaine & Moore. Hailed for her "magnetic, wide-ranging tone" and her "rock solid technique" (Philadelphia Inquirer), violist AYANE KOZASA enjoys a career that spans a broad spectrum of musical personas. Winner of the 2011 Primrose International Viola Competition and the 2015 Career Grant recipient from the Musical Fund Society of Philadelphia, she has devoted her life to the advancement of both solo viola and chamber music repertoire. She is a founding member of the Aizuri Quartet, the 2017-18 Quartet-in-Residence at the Metropolitan Museum of Art in New York City. The quartet has garnered critical acclaim for their progressive programming, and recently captured first prize at the 2017 Osaka International Chamber Music Competition in Japan. Ayane is also a member of the genre-bending duo Ayane & Paul and the electro-acoustic string trio Bird’s-Eye Trio, and enjoys playing with notable chamber orchestras such as the East Coast Chamber Orchestra, the Saint Paul Chamber Orchestra, and A Far Cry. 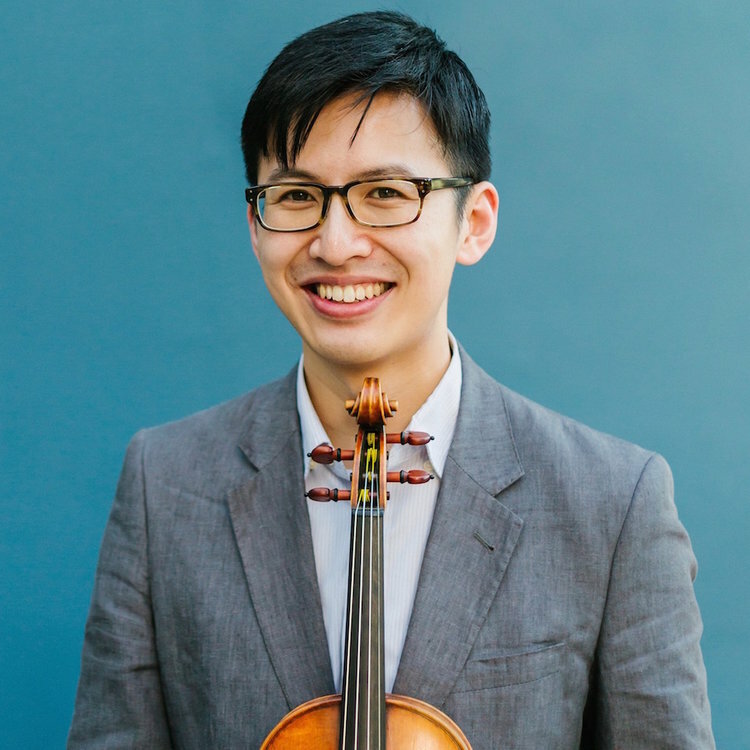 Violinist and Piedmont native WAYNE LEE is a member of two internationally-acclaimed ensembles, the Formosa Quartet and the Manhattan Piano Trio, and gives dozens of performances with them annually throughout North America, Europe, and Asia. As a recitalist, he collaborates frequently with both pianist Juliana Han and on early instruments with fortepianist Mike Lee; recent performance projects have included complete cycles of the Bach Sonatas for Violin and Keyboard, the Beethoven Violin Sonatas, and the unaccompanied Bach Sonatas and Partitas. Previously a teaching assistant at the Juilliard School, he will be joining the University of Illinois School of Music’s faculty in Fall 2018. After 17 years of living in New York City, he moved to Davenport, Iowa last week. "JASMINE LIN is a magnificent player with superb tone and strong interpretive powers” and “a violinist of remarkable intensity”, maintain American Record Guide and Chicago Tribune. As a member of Formosa Quartet and Trio Voce, faculty member at Roosevelt University and Music Institute of Chicago, Curtis Institute of Music alumna, confidante to a Cremonese violin, arranger of Grappelli tunes, prizewinner in the Naumburg and Paganini competitions, Grammy nominee, and recording artist on Con Brio, EMI, and New World Records, Jasmine likes to solicit magnificence and intensity while leaving raindrops on her nose un-wiped-off. Her biography contains precisely one hundred words. Since his concerto debut at the prestigious Ravinia Festival in 2004, violinist JESSE MILLS has established a unique career, performing music from classical to contemporary, as well as composed and improvised music of his own invention. Mills earned two Grammy nominations for his work on several discs of Arnold Schoenberg's music, released by NAXOS. He can also be heard on the Bridge, Koch, Centaur, Tzadik, Max Jazz and Verve labels for various compositions of Webern, Schoenberg, Zorn, Wuorinen etc. As a composer and arranger, Mills has been commissioned by Columbia University’s Miller Theater and the Chamber Music Northwest Festival in Portland, OR. He is co-founder of the prize winning Duo Prism, and of the Horszowski Trio. Mills is also co-artistic director of the Alpenglow Chamber Music Festival in Silverthorne, CO. In 2010 the Third Street Music School Settlement in NYC honored him with the ‘Rising Star Award’ for musical achievement. He studied with Dorothy DeLay, Robert Mann, and Itzhak Perlman at the Juilliard School. Hailed by Gramophone Magazine as “exceptionally gifted” and “breathtaking," cellist DEBORAH PAE is captivating audiences with her “superb tone...high level of interpretative intelligence” and “tremendous technical assurance” (Transcentury Blog). Since her orchestral debut at age sixteen with the New Jersey Symphony Orchestra, Ms. Pae has enjoyed concerti appearances with Sinfonia Varsovia of Poland, Orchestre Philharmonique Royal de Liège (with whom she recorded Saint-Saëns Cello Concerto No. 2 on Zig-Zag Territoire label), Orchestre Royal de Chambre de Wallonie, and Westchester Philharmonic with conductors Vassily Sinaisky, Thomas Wilkins, Christian Arming, Augustin Dumay, and Itzhak Perlman. A devoted chamber musician, Ms. Pae is cellist of the internationally acclaimed Formosa Quartet, a founding member of award-winning Trio Modêtre, and has been a featured artist at renowned international festivals including Marlboro, Ravinia, Crans-Montana Classics, and Amsterdam Cello Biënnale. Ms. Pae plays a Vincenzo Postiglione (c. 1885) and is Professor of Cello at Eastern Michigan University. PAUL WIANCKO is a composer, cellist, chamber musician, and active member of New York's new music community. As a student, Paul won top prizes at several international competitions which led him, most notably, to Poland to perform the Lutoslawski Cello Concerto with the Polish Radio Symphony. Leading a double life, Paul converted his dorm room into a production studio and began recording strings for local underground punk artists, culminating in collaborations with bands like Pennywise and Yellowcard. Paul has since worked closely with artists ranging from Chick Corea and Jóhann Jóhannsson to Yo-Yo Ma and the Guarneri Quartet. Winner of the S&R Foundation's 2018 Washington Award for composition, Paul Wiancko has been composer-in-residence at the Caramoor, Twickenham, and Methow Festivals, and has created genre-bending works for the Grammy-winning Parker Quartet, Aizuri Quartet, yMusic, and his own dynamic ensembles Ayane & Paul and Bird's Eye Trio.